We are so happy to get featured in those magazines! Described as: A sustainable dose of sexiness, Overview Mag describes the nice discovery and introduces you to our young, sustainable label: Vanilla Sand. A playful yet simple label. The first collection, Sandgirls, is characterised by lightweight fabrics, its 100% sustainable supply-chain and is made for the fun-loving millennials, who value comfort as well as attractiveness. 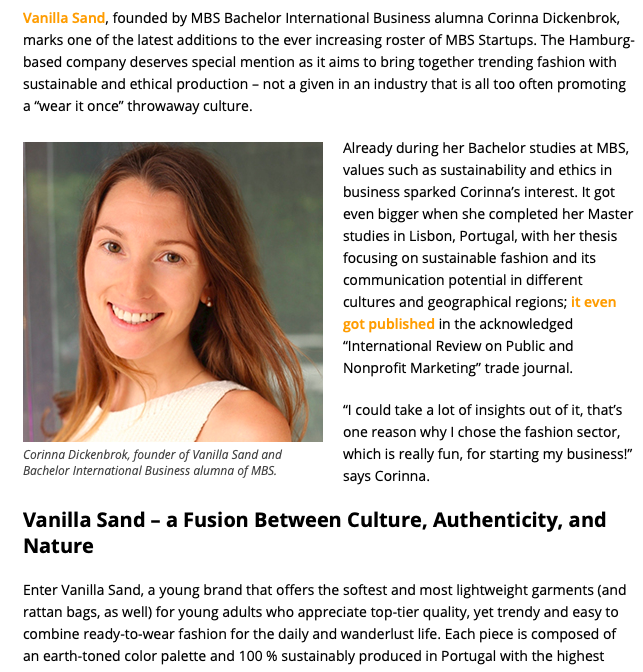 The Founder, Corinna, brings with Vanilla Sand fashion in line with sustainability. This is rare in an industry that is all too often promoting a “wear it once” throwaway culture.